and James Cohan Gallery, Shanghai. ©Mark Di Suvero. Courtesy Paula Cooper Gallery, New York and James Cohan Gallery, Shanghai. 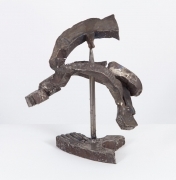 James Cohan Gallery Shanghai is pleased to present an exhibition by the internationally acclaimed American sculptor Mark di Suvero. This is the artist's first exhibition of his works in China, and in the city of Shanghai, where the artist was born in 1933. 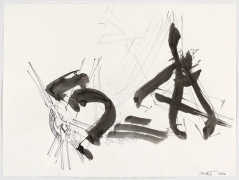 Di Suvero's parents fled the growing turmoil of the Fascist regime in Italy and came to China, living first in Shanghai and then Tianjin, until immigrating to the United States in 1941 during the outbreak of World War II. The family settled in California where di Suvero later studied philosophy and sculpture at the University of California at Santa Barbara and at Berkeley before moving to New York City in 1957. Di Suvero had his first solo exhibition in 1959 and is considered one of the most influential artists to have emerged from the Abstract Expressionist era. Known for his monumental, architectural-scale sculptures, which incorporate salvaged steel and steel I-beams, often brightly painted and ranging from 20 to 60 feet tall (6 to 18 meters), di Suvero's sculptures can be seen in over 100 museum collections, public parks, university campuses, and urban plazas throughout the United States, Europe, and Australia. Like the Constructivists artists of the 1920s and the Abstract Expressionists of the 1950s, di Suvero's sculptures thrive on geometric forms. 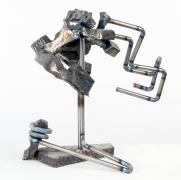 He continues to hold a singular position in contemporary art and is widely recognized as a pioneer in the use of steel and is without peer in the exhibition of public sculpture worldwide. 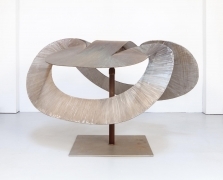 The exhibition at the gallery features tabletop-scale works made from steel, stainless steel, and titanium, or a combination of these metals. Several mid-sized sculptures will also be presented in the gallery's garden. Di Suvero's tabletop sculptures are not models or maquettes for his monumental works. He does not make preliminary designs or drawings, but directly improvises compositions from an intuitive process, creating an intimate genre all its own. The results are often calligraphic in form, exploring balance, shape, gravity, and mobility. "I'm always conscious of balance and gravity's center point," di Surveo says, "like a dancer or acrobat, I'm feeling that invisible point. Gravity is about space and is an enabling force." 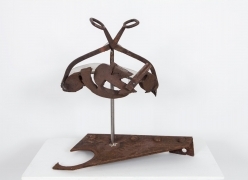 Di Suvero's unparalleled skills of bending, welding, cutting metals--the control of metal in three-dimensional space and the balance of it--instills an immediate sense of humanity and the natural world in these smaller scale works. 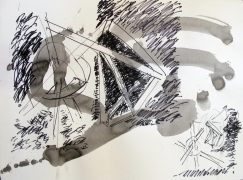 The gestural movements and dynamic forms also invite the viewer's touch and active participation. His large-scale sculpture have incorporated swings and steel plates inviting viewers to sit, climb, and engage with his works. 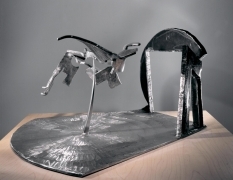 His sculptures communicate unique ideas of mass, mobility, weightlessness, and the spontaneity of the imagination. Since the beginning of his career historians and critics have cited various sources of inspiration and influences in di Suvero's work by Western Modernists artists. But China and Chinese culture, with its indelible, lasting impressions from the artist's early childhood, have long held a significant and deeply ingrained place in the artist's life and work. This is clearly evident in several sculptures in this exhibition, including Steel Cloud (for Po Chu Yi), a reference to the Tang Dynasty poet also known as Bai Juyi, or in Titanium Landscape, which features an architectural element resembling a Chinese moon gate, or in a recent Untitled (2013) sculpture in which a small gong is suspended that can be struck with a rubber mallet, delighting the viewer with its gentle and sonorous tone. Among the many exhibitions throughout his life and career, di Suvero is the first living artist to exhibit in Le Jardin de Tuileries and Les Esplanades des Invalides in Paris and at Millennium Park-Chicago. His works are included in the Hirshhorn Museum and Sculpture Garden, Metropolitan Museum of Art, the Museum of Modern Art, New York, National Gallery of Art, the Whitney Museum of American Art, the Walker Art Center, and Storm King Art Center where he has had three major exhibitions. 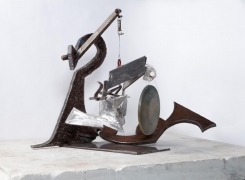 A lifelong activist for peace and social justice, di Suvero has demonstrated a generous commitment to helping artists. In 1962, he co-founded Park Place Gallery, the first artists' cooperative in New York City. In 1977, he established the Athena Foundation to assist artists to realize their ambitions. And in 1986, he established Socrates Sculpture Park at the site of a landfill on the East River in Queens, New York. Through his leadership a 4.5 acre of land was transformed by a coalition of artists and community members into an open studio and exhibition space. To date the park has hosted the work of over 900 artists. Di Suvero has received numerous awards, most recently in 2013 the Gold Medal for Sculpture from the American Academy of Arts and Letters. In 2010 he was the recipient of the Smithsonian Archives of American Art Medal, as well as the Lifetime Achievement Award in Contemporary Sculpture from the International Sculpture Center in 2000, and in 2005 the Heinz Award for Arts and Humanities. Currently, and coinciding with the artist's eightieth birthday, the Museum of Modern Art in San Francisco in partnership with the National Park Service and the Golden Gate National Parks Conservancy, has organized a yearlong exhibition of eight monumental sculptures by the artist at historic Crissy Field, situated beside San Francisco's picturesque Golden Gate Bridge. Set against the backdrop of Golden Gate Bridge, which celebrates its 76th anniversary since its completion in 1937--four years after di Suvero's birth--is a structure that has inspired di Suvero throughout his career. The exhibition brings together works from prominent collections, dating from 1967 to 2012, celebrating five decades of work by the acclaimed artist. For further information or image requests please contact Angela Li at ali@jamescohan.com or contact the gallery at +86 21 54660825. Gallery hours: Tuesday to Saturday, 10:00 a.m. to 6:00 p.m., Sunday 12:00 p.m. to 6:00 p.m., and Monday by appointment.